Professionals can swing over 120 mph. Golfers looking for extra distance off the tee sometimes make the mistake of swinging harder to increase their swing speed. But adding distance isn’t just about swinging harder, which can sometimes lead to even shorter shots. Before running out to buy a new driver, use some proven swing techniques to increase club-head speed. 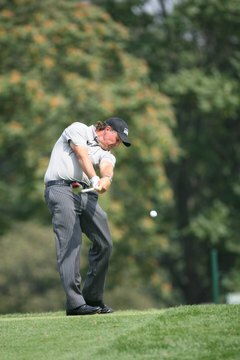 Take a look at the top players on the PGA Tour and notice that they are in much better shape than players of the past. Developing a regular fitness and stretching regimen that focuses on the back, abdominal and core muscles can help strengthen the muscles necessary for a strong swing. Many simple exercises such as crunches and hanging leg lifts can be done at home without an expensive gym membership. Working out with medicine balls can isolate abdominal and back muscles needed for a powerful swing. Grip a 3 lb. medicine ball with two hands and simulate a golf swing, focusing on releasing the body into the follow-through. This drill also helps with rotational flexibility in the back, a necessity for gaining more power. Gaining power during the swing and transferring that power into the shot is key to gaining more distance. Golfers generally lose distance because they have flaws in their swing that make it less efficient. The most important part of the swing when it comes to swing speed is the downswing. Don't swing too hard, and focus on releasing the arms on the downswing. The wrists should unhinge and the arms naturally rotate, creating a “whip” sensation. This will ensure that the golfer can make solid contact with the ball and generate more power on shots. Finding the proper swing arc is important to develop power and club-head speed. Focus on taking the club back low and slow. This will ensure a wide swing arc. At the top of the backswing, focus on making as full of a shoulder turn as possible. This will help store up power for the downswing. When beginning the downswing, make a deliberate swing with an even tempo and full follow-through to increase the club-head speed. While increasing swing speed is important, maintaining a consistent tempo is critical for hitting the ball straight and far. Take the club back and through at a controlled pace. This will prevent you from getting too strong with the hands or body and inducing a slice or hook.